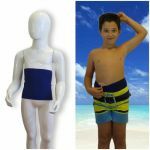 This wrap is the best solution to protect and make your child’s ostomy pocket discreet when it's at the sea or in the pool. This special model features an inner pocket that completely encloses the bag while keeping it protected and hidden. The latter is inserted through a special laser cutting aperture. The inner pocket that encloses the bag has a lapel, both top and bottom, for maximum discretion. 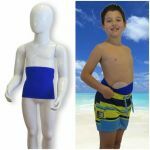 It is suitable for all types of ostomy (colostomy, ileostomy, urostomy) positioned both on the right and on the left. 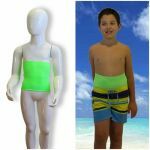 The Holiday wrap is designed for aesthetic support and is not intended for sports use, as it does not help to fix the plaque. 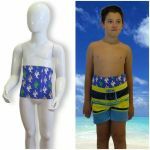 It is advisable to use it with a boxer costume model. 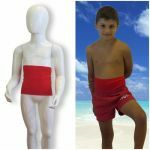 It is made of lycra 100% Made in Italy, so you can have a quick drying.